Come celebrate fall with your very own still life painting of a fall harvest. 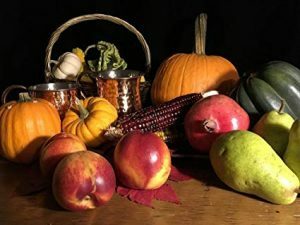 Jim Clay will start with teaching how to create a simple drawing of the harvest display, and then students can fill in the drawing with watercolor. This class is open to all levels, including absolute beginners! Jim has decades of experience in teaching beginners how to capture images on a canvas, using various techniques. In Jim’s own words, anyone can learn to draw. You will take home your finished piece, inspired by the colors, tastes, and textures of autumn. Ages 15 and up are welcome, and all supplies are provided.